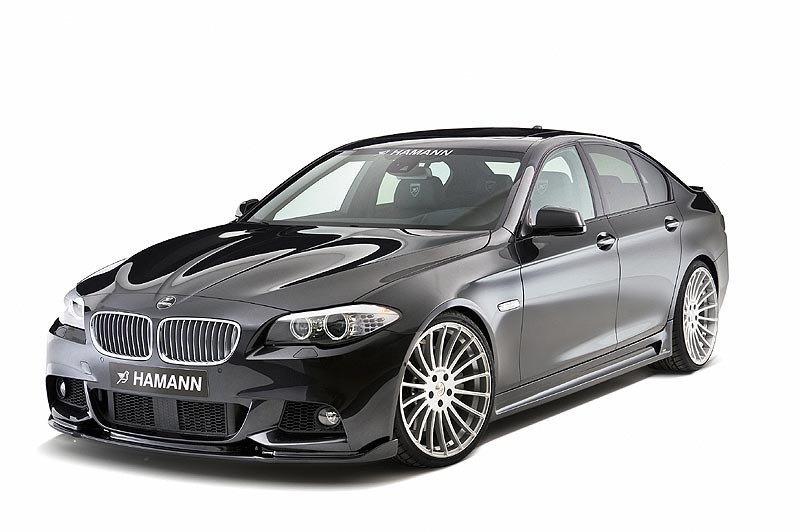 On the heels of AC Schnitzer’s offering, HAMANN finally releases images of their “M Technik” tuning program for the new F10 BMW 5 series. Right off the bat you’ll notice that HAMANN seems to be taking some styling cues from previous M models and combining that with a bit of Alpina flavor on the new 5er. Something else that shocked me about this program is that they aren’t touching performance all that much. You can get a 4-tipped muffler and a high-flow catalytic converter (for 550i only) but that’s about it. It seems like the main purpose for this program is to improve on the looks with the aero kit, wheels, and 10 piece carbon fiber interior kit. They do offer a suspension set up that will lower the car 35mm (1.3 inches) but that’s so subtle I doubt it would have much of an impact on the F10’s handling. If nothing else the kit looks great and since HAMANN stuff is hard to get stateside it is a definite way to set yourself apart if you’re looking to go for a full-on aero upgrade. 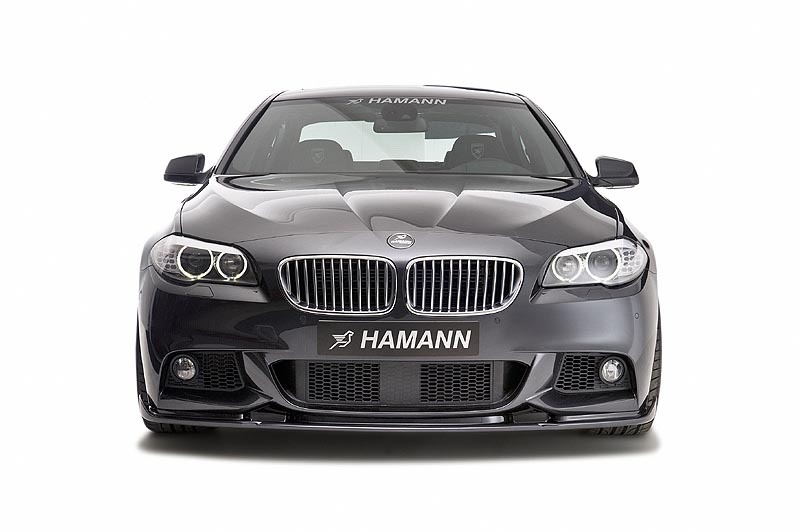 HAMANNhave extended their individualisation programme to the BMW 5-series (F10) with the M technik packet. After the presentation of the first individualisation programme for the BMW 5-series (F10) by HAMANN-Motorsport in the middle of 2010, the Laupheimer have now developed exclusive parts for models with the M technik packet. 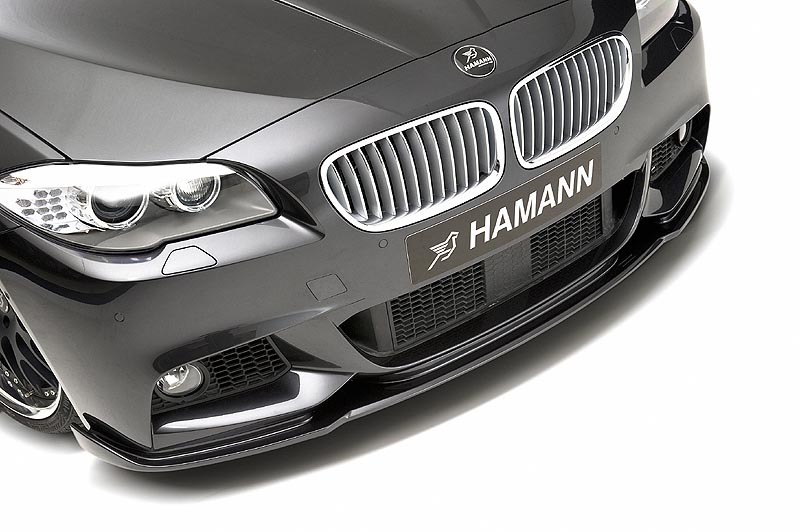 The HAMANN aerodynamic components are adapted to the original M technik front and rear valances. At the front a competition front spoiler is used, which increases the down-force. At the back an insert for the rear bumper offers space for four exhaust tail pipes. All the other enhancements already introduced in the middle of 2010, such as roof and rear spoiler, front bumper and side skirts, of course remain in the programme and are also available for the 5-series (F10) with M technik packet. Apart from cosmetic intervention in the bodywork, HAMANN offers a “pedicure” in the form of a set of extremely light alloy wheels. The most striking optics is offered by the ANNIVERSARY EVO in 21” size. The wheel, painted in silver, is delivered as a complete wheel and tyre set, with 255/30 ZR21 tyres at the front and 295/25 ZR21 sized tyres at the back, at a price of 4,760 €. HAMANN lowers the BMW 5er (F10) by approx. 35 mm with progressive suspension springs and thus further accentuates the overall sporty appearance. The HAMANN rear silencer with four tail pipes was by the middle of 2010 only available for the top model 550i. Now this option is available for all engine variants of the 5-series (F10). Only the sports metal catalytic converter with special middle silencer remains reserved for the 550i. HAMANN upgrades the interior with a 10 piece carbon interior set and a specially developed airbag sports steering wheel. The parts in visible carbon can be coloured in any preferred colour. HAMANNhas placed a pedal set in the footwell that can be obtained in silver or black anodised aluminium as preferred. A high quality set of mats including the embroidered HAMANN-logo rounds off the sporty appearance.